For years, clients in the Calgary area have trusted Alberta Concrete Contractors Inc for expert work in all facets of concrete construction -- supplying, cribbing, placing and finishing. Our company sticks with each job from start to finish. Many of our competitors will begin the work, hire a sub-contractor, and then vacate the site with your payment, leaving you to pay additional fees to the sub-contractors for their materials and time. 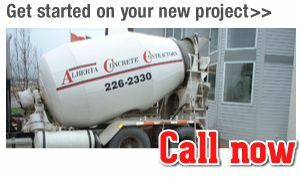 Alberta Concrete Contractors Inc stays onsite throughout the duration of your project to ensure that your costs don’t exceed your expectations. In fact, with our own excavating equipment and concrete mixer trucks, we never need to hire sub-contractors at all.